This website had its beginnings in family history. 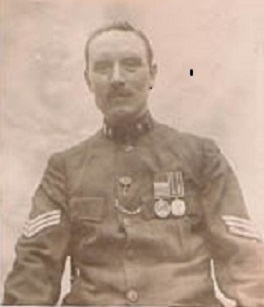 In searching for information about my grandfather David Robert Corryn Morrice I discovered that Bert was 22255, Trooper Morrice of the 81st Company the 21st Battalion Imperial Yeomanry, the 2nd Sharpshooters, and had served in the Boer War. The 21st Battalion was ‘perpetuated’ as the 3rd County of London Yeomanry (Sharpshooters) – a forerunner of today’s C (Kent and Sharpshooters Yeomanry) Squadron of the Royal Yeomanry. The regimental museum is the Kent and Sharpshooters Yeomanry Museum in Croydon where we first encountered the Boer War CO of the unit, Colonel Alexander Weston Jarvis, through his papers and diaries. His Boer War diary gave an interesting insight into army life on the veldt and the social life of a prominent late Victorian. Interesting enough for us to transcribe the diary and publish it as A Boer War Sharpshooter (Salient Books, 2010). 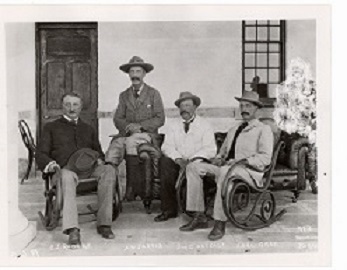 This website covers Weston Jarvis’s earlier exploits in the Matabele Rebellion of 1896 and gives an insight into his life as a sportsman, socialite, business man and soldier. Supposedly convalescing from injuries received in a hunting accident he takes the opportunity to travel to Rhodesia for some big game hunting and to check up on his business interests in various mining companies. Within weeks he is caught up in the Matabele Rebellion and his active soldiering life begins (and continues intermittently for the next twenty-three years through the Boer and Great Wars). As all his diaries reveal, he loses no opportunity to increase his large number of influential friends including in this case Cecil Rhodes, Earl Grey and Herbert Plumer who was to become a most important general in the Great War. Many other diaries and photograph albums are available at the museum, chronicling Weston Jarvis’s military career from the Matabele Rebellion of 1896, through the early stages of the Boer War serving under Plumer and taking part in the Relief of Mafeking, the period of the Boer War with the Yeomanry, as ADC to the Duke of Connaught during the Delhi Durbar and for the entire duration of the First World War. A Great War Sharpshooter Volume I Norfolk, Egypt and Gallipoli, 1914-1916 (Salient Books, 2012) covers the period 1914-1916 when Weston Jarvis was in command of the 3rd County of London Yeomanry (Sharpshooters) and the final wartime diary has been published as XIX Corps Camp Commandant, Volume II, The Western Front 1917-1919 (Salient Books, 2015). In 1888 Cecil Rhodes negotiated with King Lobengula of the Ndebele (called the Matabele by the British) for the rights to mine, but not settle, in a vast area of what is today Zimbabwe. However, conscious of competition from the Boers and the Germans, Rhodes and the British South Africa Company raised the Pioneer Column in 1890 and effectively annexed Matabeleland and Mashonaland and settled on the land. The territory was in effect ruled by the British South Africa Company through its British South Africa Company’s Police (BSAP) which numbered about 750 officers with some support from volunteers and friendly native tribes. Lobengula tried to avoid confrontation with the Company’s forces, but intervened in 1893 when a local native chief in the Victoria district was emboldened to refuse to pay tribute. The local people were defended by the BSAP when Lobengula’s forces mounted a raid and this eventually led to a full scale confrontation between British Colonial troops and the Matabele. Lobengula’s capital at Bulawayo was captured and destroyed by the British who then made it their chief town in the region. Lobengula fled, dying of smallpox the following year and the remaining Matabele chiefs submitted to the British South Africa Company which took administrative power over Matabeleland. This First Matabele War had been short and was characterised by the vastly numerically superior Matabele forces being overcome by the brute power of the Maxim machine gun. The Second Matabele War, or more appropriately the Matabele Rebellion, which is now known in Zimbabwe as the First Chimurenga erupted at the end of March in 1896. A number of reasons combined with an opportunity were the cause of the war. 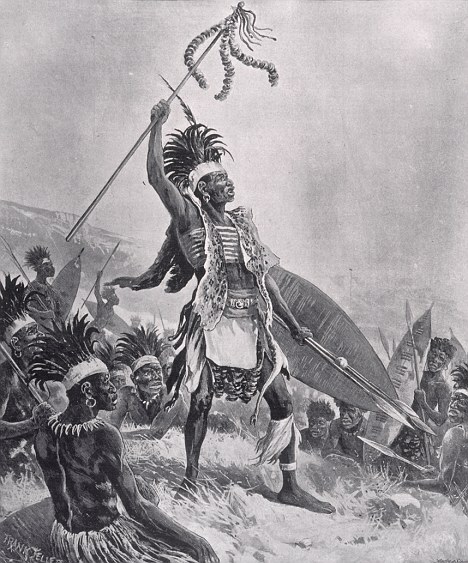 In the first place, whilst the British South Africa Company and the settlers felt that the Matabele had been defeated in the first war, the Matabele themselves did not subscribe to this view. They had some success in the first war, retained their vast numerical superiority and were relatively well-armed with Martini-Henry and Lee-Metford rifles in addition to their traditional assegais, knobkerries and axes. In addition to complacency over the submissiveness of the Matabele, the Company could be accused of ineffective government and administration of the region. Native Commissioners were appointed to the various areas which they effectively ruled through a police force of about 150 men recruited from the local Matabele. These native police frequently took the opportunity to settle old scores with the natives and generally tyrannise the population. The white settlers including miners and prospectors were also not blameless, as though many gained the respect of their black neighbours, too many regarded the natives as inferior and their women as legitimate targets of their sexual needs. Of major importance were the many issues surrounding cattle. At the end of the first war King Lobengula’s cattle had been claimed by the Company as war reparations. As a despotic ruler the King owned all the quarter of a million cattle kept by his people and in 1895/1896 the Native Commissioners were still collecting so many each month and passing them to the Company. To the natives the cattle provided most of the essentials of life and their loss was a very serious matter. So much so that the problem was recognised by the Commissioners and it was agreed that 55 percent of the cattle would be handed back as Native Cattle. Unfortunately it was at this moment that rinderpest struck the cattle. This infectious viral disease was sweeping through southern Africa and the only solution was a cull that eventually accounted for 80-90% of all cattle in southern Africa. The natives could not understand why the cattle had been returned to them to be immediately shot. The disease was also to eventually have a major impact on the logistics of transporting relief forces nearly 600 miles from Mafeking where the only really effective transport were trek oxen. Volunteer Field Forces were created in each of the laagers. The Belingwe Field Force was comprised of just 44 officers and men under Captain Tyrie Lang, Gwelo initially raised 80 men but the force grew to about 350 with men (including Weston Jarvis) coming in from the surrounding areas and 52 men under Commandant Cornelius van Rooyen comprised the Mangwe Field Force. The Bulawayo Field Force was the largest with about 500 men under Colonel William Napier, but Bulawayo was surrounded by up to 15,000 Matabele, 2000 of whom had Martini-Henry rifles. Initially mounted patrols were sent out to bring in people from outlying areas but soon this activity ceased and the occupants of the laagers settled down in fear of the large forces ranged against them and waited for relief from outside. Within days Lieutenant-Colonel Beal leading a relief column of 150 men and accompanied by Cecil Rhodes was setting out from Salisbury to Gwelo and Lieutenant-Colonel Herbert Plumer was organising a volunteer force of 750 to relieve Bulawayo from Mafeking nearly 600 miles away. It was to be the 11th May before Rhodes arrived at Gwelo and Plumer did not reach Bulawayo until 24th May. In the meantime about 1500 women and children nervously sheltered in the laagers.